In 1882, when the Toledo and Northwestern Railroad company was purchased by the Chicago and Northwestern Railroad, the line was widened from narrow gauge to standard and bypassed Callanan to head towards Jewell (Jewell Junction) to junction with the Toledo and Northwestern RR line (the east/west railroad). The railroad section crews assembled along the line and changed it to standard gauge in one day, Sunday, May 28, 1882. This bypass of Callanan insured that settlement would only survive about three years, with most residents moving to either Ellsworth or Jewell. The birth of Callanan was the death of Lakin's Grove. Most of the businesses and professional men moved to the railroad town. Callanan, the first platted town in southeast Hamilton County came into being in the spring of 1878 when a Narrow Gauge Railroad, the Des Moines and Minneapolis, was built noth of Ames. In the early spring of 1878, a depot was built and the railroad was completed. The town was laid out the same year. It was first called Lakin, but when a post office was established, the railroad named it Callanan for the president of the road. Callanan grew like a mining boom town. It was built in a great agricultural country and large shipments of grain and livestock were sent out and needed commodities brought in. It has been reported that 2 passenger trails - one norh-bound, the other south-bound, were in full operation daily. By the fall of 1878, Callanan had everything but law enforcement and a bank. There were two saloons and all the things that went with them at the time. It was told they each cleared more money than any other business. Callanan lived and grew fast for nearly three years, and lots of gambling and two murders were reported. One murder was by a drunken bystander on the Fourth of July, who fired a revolver into the crowd on the platform of the depot striking one Jacob Heng on the leg. The doctor amputated the leg using the kitchen table for the operation. Mr. Heng lived for about 3 weeks. The other case was that in which Hilga Espe killed Joe Isley. Espe was a storng, muscular fellow shile Isley was a little old man. Both were drunk. Espe wanted to fight Isley, but Isley refused and started to go away. Espe followed and picked up the smaller man, threw him from the sidewalk upon the frozen ground with great force and left him there. Someone at a distance saw the act and went to the old man. Finding him unconscious, people in the crowd took him, laid him upon a bench where he remained unconscious until the next day when he died. This 1958 map, an aerial view of the Callanan area, was secured from the Iowa DOT. North is up. It shows today's railroad track coming up from Randall, and turning towards Jewell. The curved line shows how the 1877 track turned towards the East, crossed the Skunk river, and ended at the intersection of four townships in the southeast corner of Hamilton County. When the railroad bypassed Callanan, and Ellsworth needed a depot, the Callanan depot was pulled (on skids) to the new community of Ellsworth to become the Ellsworth depot. 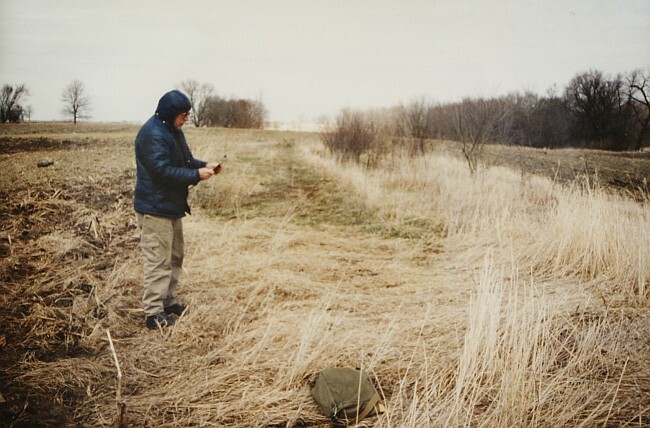 While no images are available for the town of Callanan, several recent photos of that area nearby Callanan, travelled by the narrow gauge railroad track, are seen below. The area is photograhed below, and can be spotted in the IDOT map (seen above) directly above the words Track (1877) just to the left and right of the creek seen in that area. 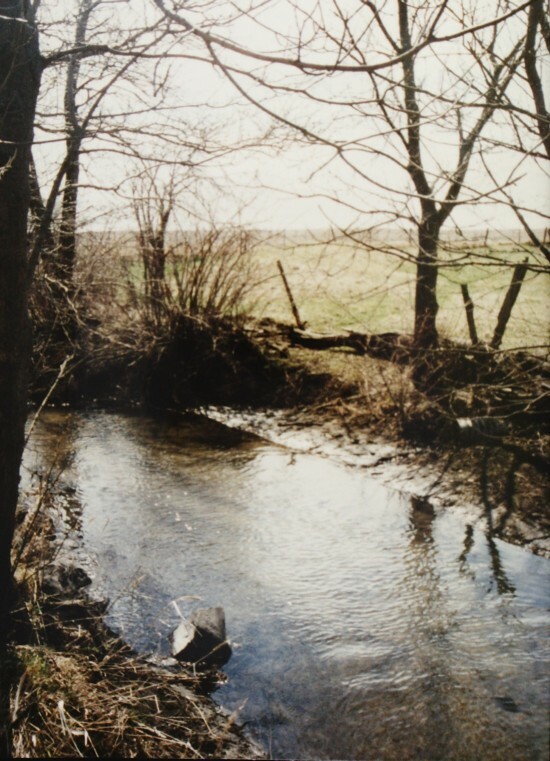 This creek was west of the Skunk River in the Callanan area. 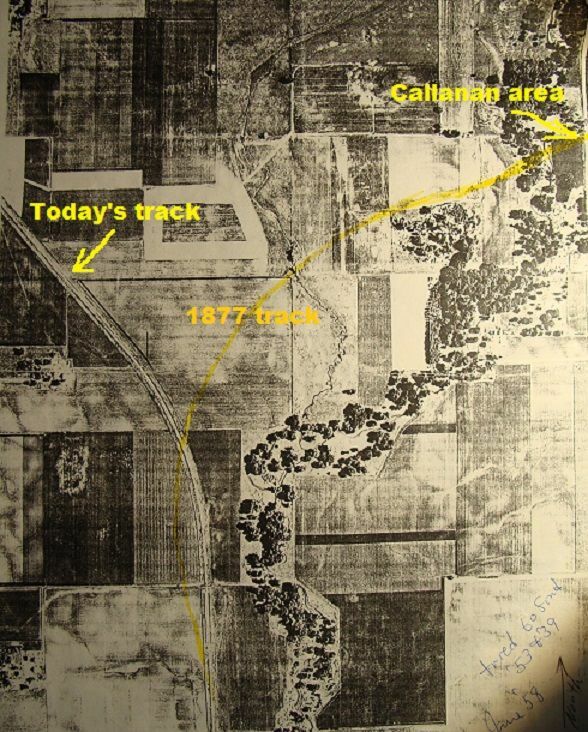 Callanan, the first platted town in southeast Hamilton County, came into being before the spring of 1878, when a Narrow Gauge Railroad 3 feet wide, the Des Moines and Minneapolis, was built north of Ames. The railroad was being built on the west side of Skunk River; but in order to get 5 per cent tax is was required to come within a mile of the four adjoining corners of Lyon, Lincoln, Ellsworth and Scott Townships. To do this it was necessary to build a spur across the river. A high grade from the bridge to the top of the hill east with an incline of five hundred feet to the mile. This made a very steep long grade. The bridge and grade were supposed to be only temporary just to get a train across by a given date in order to collect the tax. The grade was so steep to get into Callanan that trains would take a long run and sometimes failed to make it, had to back down and try again. Then the idea of backing up the hill was used as the engine needed more push than pull. In going out all brakes were set. 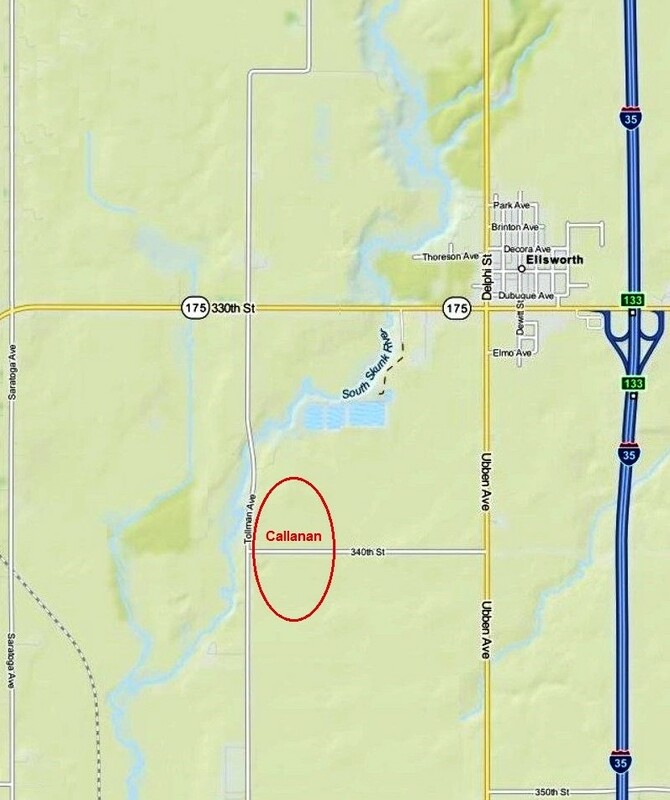 This railroad expected to build north through Webster City, but only a 21/2 per cent tax was voted so they stopped at Callanan possibly to go northeast to Alden. The town Callanan was being started on the west side of section one of Ellsworth Township and section 36 of Lyon Township in the winter of 1877-78. The depot was on the south side. In early spring, the Narrow Gauge Railroad was completed and the town laid out on April 19, 1878. It was first called Lakin, but when a post office was established, the railroad named it Callanan for the president of the railroad. In November 1878, the south half of the southwest one fouth of section 36 of Lyon Township was laid out in town lots and called North Callanan. Streets were laid out, the business district evidently ran north and south with River, Main, Everett, Willow, Scott, Lyon, Cherry and Vine; east and west streets were Lincoln and Ellsworth. Later, there was made an addition to North Callanan with River, Main and Vine Streets. This settlement was built in a great agricultural country and large shipments of grain and livestock were sent out and needed commodities were brought in. In the fall of 1878, Mr. Sherpy started the Herald. In a copy of the Herald dated December 14, 1878, it was noted that the subscription was $1.00 per year if sent in clubs of five or more and before January 1st. "If you haven't any money, we won't object to several tons of potatoes, cabbage or anything that can be eaten. Patronize your home paper and save your country." The Herald had a hard time to live, and Frank Bell was the editor after a few weeks. It was revived again and the name cas changed to Register. A school house was built and a County Teacher's Institute was held in it. Professor Eldridge, one of Iowa's noblest men and one of the best educators in the United States conducted the classes. Louise Anderson, who later married Wig Bonner, taught one of the first terms of school. Church and Sunday School were held in the school house. The Callanan people probably used the Ringer Semetery as some know people from Callanan had been buried there earlier. It would be only about one and one half miles north. This could account for the larger number of unmarked graves. Although no bank had been organized, by the fall of 1878, Callanan had everything but law enforcement and a bank. There were two saloons and all the things that went with them at the time. It was told that they each cleared more money than any other buisiness. raised area on the other side of this fence. 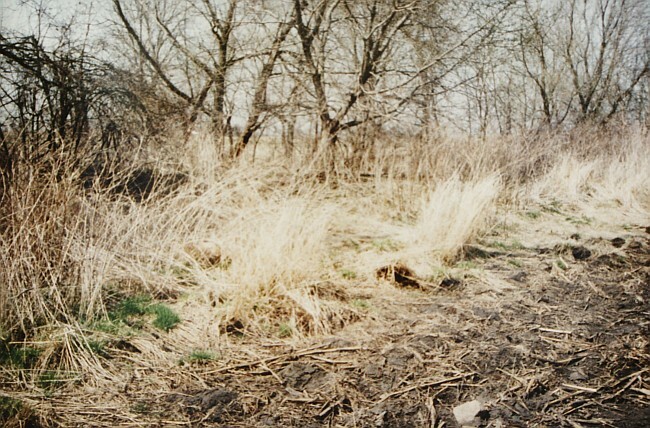 The narrow gauge railroad bed is seen just above, where no grass is seen. A year passed by and the Narrow Gauge Railroad remained in operation from Ames to Callanan. It has been reported that 2 passenger trains - one north-bound, the other south-bound - were in full operation daily. The railway company refused to go north through Webster City unliess they received the full 5 per cent tax. However, they threatened to go north by way of Blairsburg or Williams unless the 5 percent tax was conceded. By 1880 it was realized that the Chicago Northwestern was back of the Toledo and Northwestern Railroad (east and west). So it was that on December 6, 1880 that a regular passenger train made its first run on this line through Hamilton County. Then, too, a transfer stage was put inot operation between Ellsworth and Callanan, a distance of a little over a mile. So now the people had railroad facilities both south to Des Moines and east to Chicago. J. Delorme, manuafacturer of boots and shoes. Scandinavian Hotel, A. Anderson, proprietor. Within a few years, most of the businesses of Callanan moved to Ellsworth, and some to Jewell. 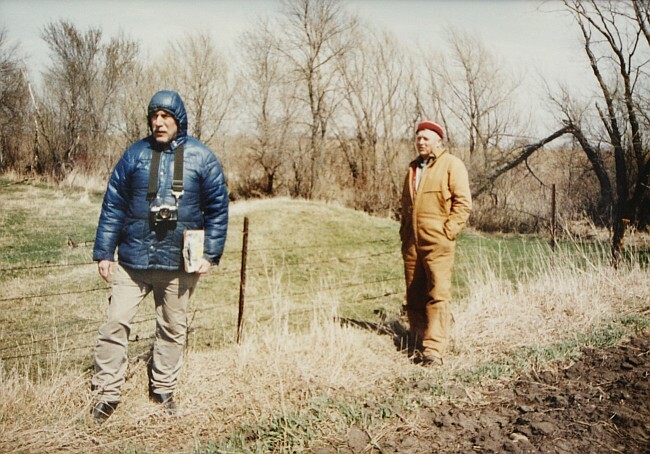 After the town of Callanan was gone, John Ringstad bought the land. headed towards the Skunk River and climb the hill to enter Callanan.